Onion rings are a popular western snack. 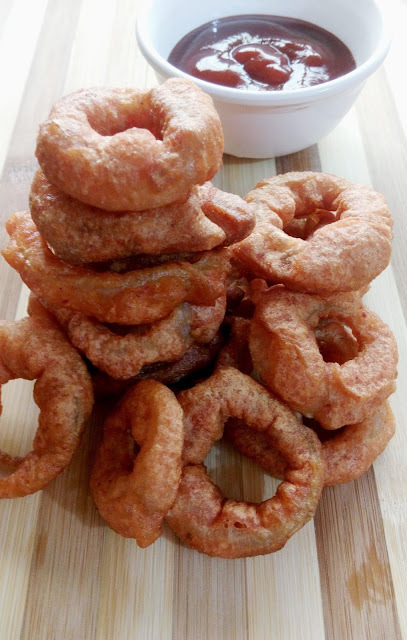 The batter in western recipes is often made with flour and Beer.Here I am presenting Onion rings Indian style with no Beer and lots of red chilli powder.Hope these fuss free crispy onion rings will become a regular snack in your house too just like mine. Cut the onion into circular slices and separate them into rings. In a large bowl,mix all purpose flour,corn flour,baking soda,red chilli powder,vegetable oil ,salt and water till you get a semi solid batter like consistency.Let this batter rest for 5 minutes for baking soda to act well. Take vegeatble oil in a thick bottomed pan.Heat it on high flame till its ready for frying. 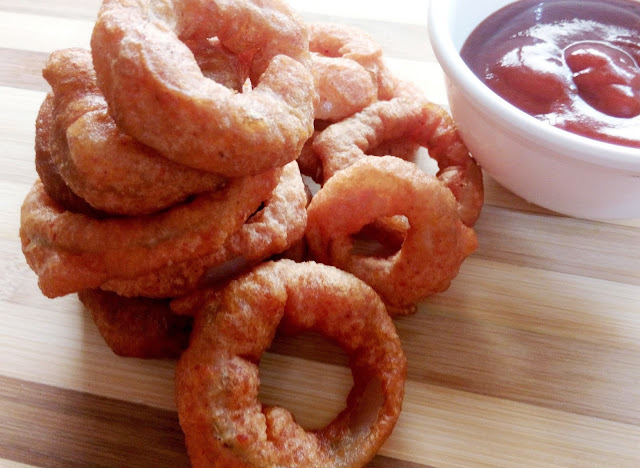 Dip each ring in batter and put in pan with oil.Fry these rings first on medium heat and then on high heat till rings get golden brown in colour. Remove onion rings from pan and serve hot with tea or as starter.